Drama work stations often strike fear in the hearts of many educators. In a recent workshop with teachers I showed a video clip on how to introduce the drama station in a 1st grade classroom from Launching Literacy Stations. 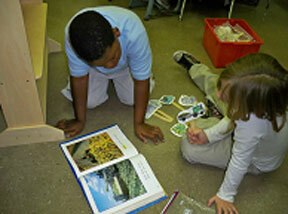 At this station, two children work together to read or retell a familiar book. In the video, we use the book, Hobbledy Clop by Pat Brisson. It’s a cumulative tale with lots of opportunity for children to join in with the repetitive line, hobbledy clop, as well as to participate in making sounds, such as meow and ssssss along with the animal characters in the book. Have you been thinking about setting up a drama station in your classroom? Here is your chance to find out all you need to know about making this great station work for you and your students! Watch the video and then you can download two chapters from Practice with Purpose and Literacy Work Stations where I talk about setting up a drama station. 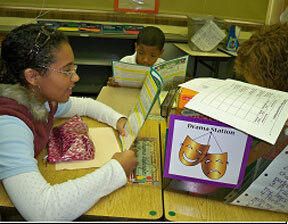 Last week in York, PA I saw students involved in lots of reading at drama work stations. This is a station that has great potential to develop reading fluency and comprehension, since kids love to act out stories! Teachers used readers’ theater from a variety of sources, including their core program (Harcourt) and www.readingatoz.com. The pictures below show the variety of ways drama stations were being used. First graders use their core program books and retelling pieces to practice rereading familiar text at a drama station. Kids in fifth grade read readers’ theater scripts from Lakeshore Learning. 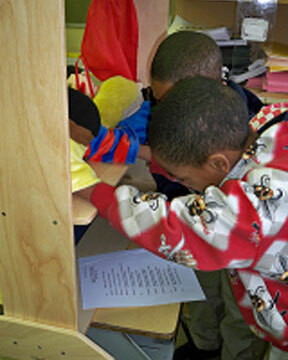 Second graders read readers’ theater scripts and use puppets at a drama station. Readers’ theater scripts from Harcourt are enjoyed by these 4th grade girls. Recently, I blogged about the Drama Work Station and received a comment from Alexis O’Neill, the author of The Recess Queen. I had mentioned that this is a great book for students to retell and dramatize at the Drama Station. After hearing from Alexis, I emailed her and asked her to be a Guest Author on my blog, and she agreed. What would you like her to tell us about? Q: How did you come up with your story? A: This is going to sound incredibly silly, but I began the story because I liked the sound of “mean” “Jean” and “queen” together (and I do hope that any of my friends named Jean do not take my book personally . . . ) Then I wondered what Mean Jean would do – and what she kingdom she would reign over. Since recess was (and still is) my favorite part of the day, I made her queen of the playground. The character of Katie Sue was inspired in part by my niece, Megan Rose, who on the surface looks quiet and shy but is the most energetic player I know. Other parts of the book were inspired by my younger nieces Stephanie, Allison and Laura, but mostly by my sister, Donna, who has a great sense of humor. Q: How long did it take you to write your story? A: I wrote notes for The Recess Queen in 1992. The first title was, “Mean Jean, the Playground Queen.” But I just kept putting notes into a folder off and on for a long time. I wrote the first two pages in 1993. I wrote the first full draft in January 1999. Then I workshopped about 6 revisions with my writers group before I sent my story to a publisher in June 1999. Q: Have you written any other books? A: In addition to The Recess Queen, my other books include Loud Emily and Estela’s Swap. My newest book, The Worst Best Friend, is a companion to The Recess Queen. I hope you’ll read aloud these books written by Alexis O’Neill to your class and try them soon at a Drama Station. Let us know what you try! We love pictures, and so does Alexis! Leave your questions in the Comments area and send your photos of your drama station to d.diller@live.com.